The Cajun Strangers play the dance music of the Cajun culture of SW Louisiana at festivals, dances, parties, concerts and weddings. The music is a mix of two-steps, blues, waltzes and zydeco, played on the button accordion and fiddle, with a rhythm section of guitar, electric bass, drums, rubboard, and T-fer (triangle). Many songs are sung in Cajun French with some songs sung in English. 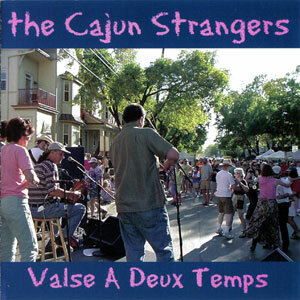 Their first CD, Valse a Deux Temps, was released in 2006 and won the Prix Dehors de Nous Award from the Cajun French Music Association in 2007 for the best Cajun CD by a band outside of Louisiana. 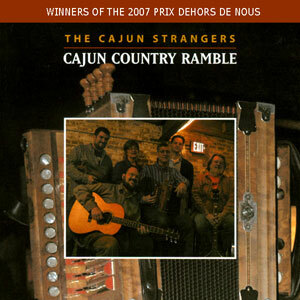 The second, Cajun Country Ramble, was released in May 2009 and builds upon their initial effort with more song variety and maturing musicianship. It was awarded the Prix Dehors de Nous Award in 2010. The Cajun Strangers have shared the stage with national touring groups such as the Red Stick Ramblers, the Mamou Playboys, Geno Delefose, Feufollet, Chubby Carrier’s Bayou Swamp Band, Thomas Big Hat Fields, Dennis Stroughmatt, and the Lafayette Rhythm Devils. Brian O’Donnell, fiddle – Brian caught the Cajun fiddle bug at the Ashoken camp in New York, became enamored with Dewey Balfa and Dennis McGee, and promptly headed down to Lafayette, LA for six weeks of Cajun jams and bayou exploration. He managed to get a Lafayette library card, listened to every Cajun record they had, and got some lessons from Courtney Granger and Kevin Wimmer. Brian is a much sought after fiddler in Cajun music circles and he also plays bluegrass and old time music. John Fabke, guitar – One of Southern Wisconsin’s finest traditional musicians, John Fabke has been involved with a wide variety of roots music styles for the past 17 years. Fabke played Cajun guitar with the Madison-based Grand Chien Cajun band and has also performed with Steve Riley and the Mamou Playboys. Along with Cajun music, Fabke also plays banjo, guitar and mandolin in blues, bluegrass and old-time country settings. Jim Schwall, bass – Although he writes songs and plays several kinds of music on several instruments, Cajun Strangers’ bass player Jim Schwall is best known for playing blues guitar in the Siegel-Schwall Band. After hearing Cajun bands in pre-Katrina New Orleans, Jim traveled west to Cajun country to soak up more Cajun music and culture around Breaux Bridge and Eunice. Karen Holden, t-fer, dance instructor – Karen started playing Cajun music when in about 2001 she stopped dancing to listen to the music. She plays t-fer (“little iron”) in the band and provides dance instruction.